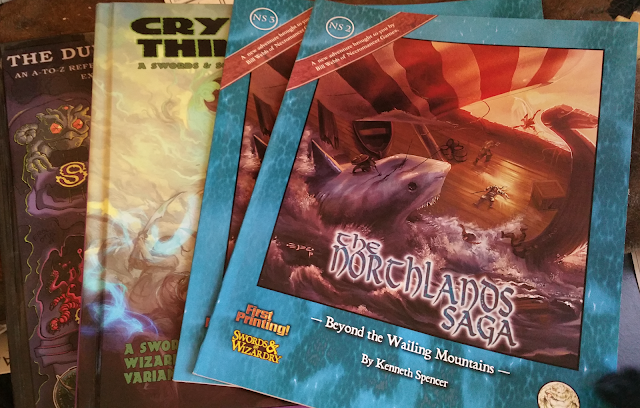 Today we're giving away The Northlands Saga NS2 and NS3, along with its Crypts & Things 1st edition (a Swords & Wizardry Variant ruleset for Swords & Sorcery roleplaying) and The Dungeon Alphabet, 3rd Printing Expanded Edition. I have NS1 somewhere and if I find it before shipping I will include it. I backed the KS and no longer need the individual modules. I have the new 2nd edition of Crypts & Things and I have the black leatherette cover of The Dungeon Alphabet. So, duplicates to be given away as a single package. 1 - I'm only shipping to the US, but anyone can enter. If the winner is randomly picked from outside the states, they will get a $10 RPGNow Gift Certificate and the physical prizes gets bumped to the 12 Days of OSR Christmas or something. 2 - You need to leave a comment below to enter. Thats pretty much it. 3 - Your comment must be made prior to 12 PM Eastern Time, Thursday, October 20th, 2016 - Yes, only 48 hours. Hardcover +PDF copy of Swords & Wizardry Complete Rulebook, Monstrosities Hardcover +PDF, Cover Poster, Bill Webb's Deck of Dirty Tricks, Bill Webb's Book of Dirty Tricks Softcover +PDF, MCMLXXV (1975) Softcover +PDF, Grimmsgate Softcover +PDF, The Five Maidens Softcover +PDF, Zaya’s Promise Softcover +PDF, +All unlocked physical and digital stretch goals! What are the stretch goals that have been hit? these releases by themselves are 10 bucks a pop in print. It makes the $225 Complete Gamers Package almost impossible to pass up. Here is my comment to enter. Oh, why are you only shipping to the US? because the US Postal Service makes up for it's domestic losses by vastly overcharging on international shipping. Holy cow, what a cool giveaway. Count me in! Been looking at those Northlands for a long time now. I hereby make my comment to enter the contest and I would really like this, it's a bunch of stuff I always planned on getting eventually. Huge fan of the Wizardry. And the Swords. Mostly the Wizardry though. These are some very nice giveaways you're running. Yay yay I want this cool stuff ! I've got a good feeling about this!! I'm a winner and I deserve this! Sweet. A is for ankheg. Looks like good stuff, here is my comment. Awesome. B is for Bulette! Count me in. Good luck! I would like to be considered. Thanks! Once again Tenkar demonstrates his amazing generosity. The package looks great. Thanks for offering this. Reading 1st edition Tunnels & Trolls, I noticed that the Rogue seemed like a better version of the Warrior: all the benefits, plus the ability to cast magic if you get it. Reading about the level limits for non-humans in S&W was what made the choice click for me. Warriors in original T&T have the ability to advance further than the Rogue, who changes Type after level 7. Here is my official comment to enter. May the odds be in my favor. Whoa, great selection. Count me in! I actually use RPG's to reinforce concepts that my kids learn in school. Here's my entry! This sounds awesome! Another generous giveaway. Thank you Tavernmaster! Oh gosh! I missed the 1st ed C&T but now have the 2nd. I would love the chance of acquiring it. Please count me in. Don't blame me I voted for Ralph Nader. Crypts & Things is a nice spin on S&W. Here's hoping I win! Wow! Thanks for being so generous! Thanks for the great shelf-clearing extravaganza! Intrigued to check out the Crypts and Things variant. Would obviously be happy to win this. Holy moly! What a sweet package! Pick me! That's a lot of stuff . . . consider my hat in the ring! I will see if lady luck smiles on me this time. That is a lot of fun stuff. Am I exempt from winning? What kiND of comment should I leave? Please count me in for another nifty giveaway. Thanks again. You got to draxx them sklounst. Long time listener, first time caller here! Thanks and rock on! SWEET! Big fan of Crypts and Things! I have none of those! Those are cool books. Here's hoping I win. Hopefully I can win this one! May the 27 homonculi of the 11 Dancing Necromancers perform spin-flips and ritual capering for your Kickstarting amusement! I cast my name into the lot! Additionally, since I am less polite as "Lord Mhor", may Eldritch Excrement from Ancient Demons rain thickly upon those who would castigate this Great Work! Great googily-goo, count me in too! I would like to be included in this. Thanks! 'Precisely this thought deters me,' Cugel replied. 'I am a man of resource, but not insensate recklessness.'" Love the Vance quote, above. Here's to being lucky. Those sound great, I'm in! You can't win, unless you in. An obvious ploy to garner traffic. I thoroughly approve. Okay, this is me commenting to you. I'm commenting right now. Right now I'm commenting! Thank you for the generosity. My eye is on the alphabet. I would like to win this as well. I think if I had the Dungeon Alphabet in print I would use it! I hope I win (but good luck to everyone)! As always, trying to win. Nice loot. Hope I win. I'm really considering that complete gamer pledge. If they hit the 40k stretch goal I don't think I can resist. Crypts and Things looks like it could be fun. Tenkar, you rock! Godforsaken autofill. Anyway - this is a great offer on the part of the Tavern and I'm going to head over and check out that kickstarter. Nice! Crypts & Things is awesome. Sure, I'll throw in a comment. And while I'm at it - let me say thanks for all that the Tavern is - the content, the links, the information (and sometimes drama...). Keep up the great work. Awesome. Thanks for the opportunity! I'll go ahead and sign up for the giveaway too! Yay! a flash give away long enough that I have spotted it before it's over. Today's my birthday, so this must be mine!